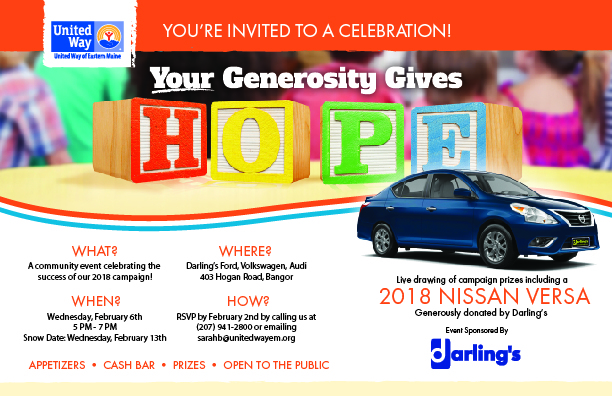 Please join us at Darling’s Ford, VW, Audi on Wednesday, February 6th* from 5-7pm. We’ll be celebrating businesses and non-profits alike who work so hard to ensure the health, education, and financial stability of every person in every community we serve. We’ll hand out awards to all the folks that have gone above and beyond, recognizing their phenomenal efforts! And, did we mention that someone is going to win a NEW CAR??! WABI-TV5 will be onsite for a live feed to capture the announcements of this year’s prize winners. A huge THANK YOU to our hosts and sponsors, Darling’s. There will be light hors d’ oeuvres and a cash bar.